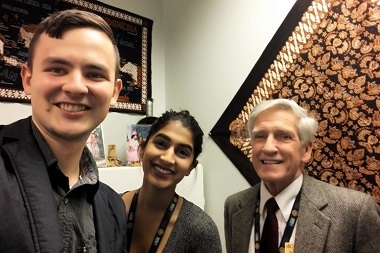 Dennis Kirkley (right), lead chaplain of the Vancouver Airport Chaplaincy, with student interns from the YVR IT department. He quickly learned why. Polly* was transgender, and had been recently disowned by her family after years and years of not being accepted. Her mother died a few years ago, and her father finally told her to leave his house. “She’d been living with her father for years because no one in her city would hire her. She had a degree – she showed me the paper. She could teach, but had never been able to get a job,” Kirkley says. With no options left, a friend offered to buy a flight to Vancouver where they hoped Polly would have better luck. She arrived with no contacts, no plan, no job – and was noticed by Customs, who directed her to the Chapel. Kirkley and his team connected her with agencies which helped her prepare for the refugee claimant hearing, find accommodation and complete paperwork to settle in Canada. 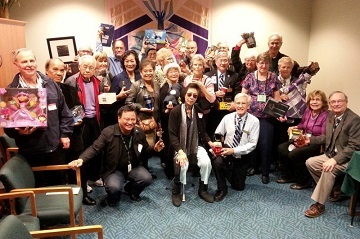 This is the whole YVR chaplaincy team, made up of board members, associate chaplains and host volunteers. This is just one example of the work Kirkley and his team do at the Chapel. Talk with him for any amount of time, and you’ll hear story after story spill out, as he sketches a picture of the incredible range of human need they encounter. As an inter-faith ministry, the YVR Chaplaincy has met this need with spiritual and emotional support for 30-plus years in International Arrivals. The current Chapel, which is slated to be enlarged next year. 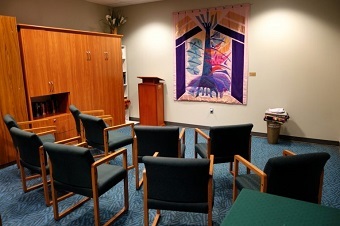 YVR is supportive of their work and recently decided to expand the current Chapel facility in 2018 and provide a second chapel past the security gates in 2020. That’s where most people in the airport are, so it’s a great answer to prayer. The current Chapel gets more than 1,000 visitors monthly, and operates with a team of 35 volunteers, 10 chaplains and five board members. Currently all the volunteers are Christians, though all faith groups are welcome to participate in this ministry. The Chapel is also there to serve YVR staff. Kirkley, who works with the Canadian Baptists of Western Canada, wants member churches [and no doubt others] to know the Chapel is available for groups to gather and pray before a trip, or for goodbyes. They offer tours of their own space and the terminal. *Polly’s name has been changed to protect her privacy. Zoe Ducklow is senior writer with the Canadian Baptists of Western Canada. This article is re-posted by permission. Blessings Dennis and VAC team. Keep up the good work.